…a more in-depth Rockman series timeline, and maybe a few new fan holidays (or more reasons to celebrate existing ones). To investigate this incident, we’ve decided that “Rock” will go out and try to return the 6 robots home. Words cannot express the pain in my heart at having to convert “Rock”, a household robot by nature, into a combat-ready battle robot, but “Rock”…. No, “Rockman”! Right now, you and you alone possess the power to stand against this monstrous shadow of evil that has descended over us. …That’s right! In all the world there’s only one man with the technological prowess to have remodeled my robots and turned them into servants of darkness! Dr. Wily!! We’ve received a written challenge from none other than Dr. Wily, whom we believed to have been utterly defeated after that last battle. It seems he’s somehow managed to complete 8 of his own combat robots, designed specifically for destroying Rockman. ROCKMAN 3 END OF DR. WILY!? Dr. Right often seems like a jolly, naive, happy-go-lucky do-gooder. These passages portray another side to his personality–how deeply wounded and conflicted he is by the betrayal of an old friend, the corruption of his “children” and his life’s work, and his struggle to hold onto his ideals in a less than ideal world. Is he so often deceived by Wily because he is just that gullible and soft on crime, or because he chooses to believe in mankind’s capacity for redemption? Is he standing up and living his life for a set of principles that he holds himself to even against all challenges and adversity? To do what is right, despite when such actions torture him inside? Not because he trusts Dr. Wily or even thinks that he deserves all the second chances he is given, but because Dr. Right is a man who extends forgiveness and makes the difficult choice to place his faith in the goodness of his fellow man, just to hold his head up high and face himself in the mirror? I’ll leave that for you to decide. For now, let’s talk timelines! From the text above we can say with certainty that 5/25 is the day that Rock was reborn as Rockman and sent out on his very first adventure. 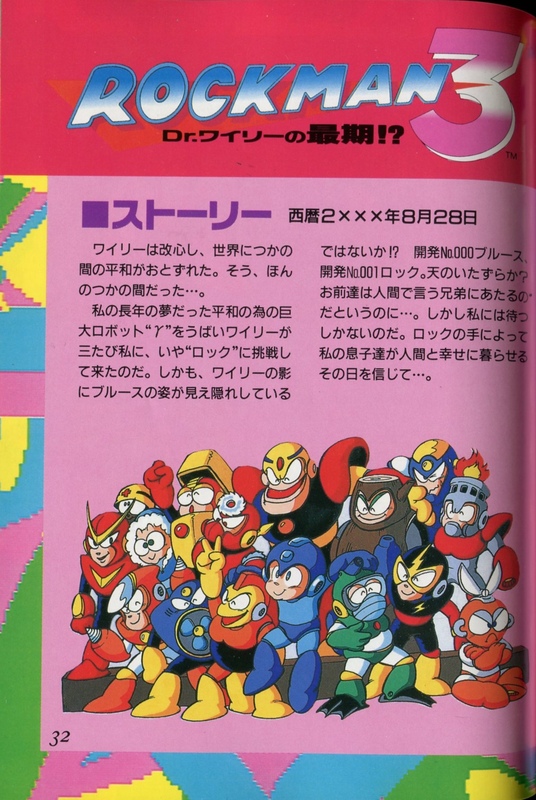 The date you might say that Rockman was really created. And thanks to our previous Rockman 2 information, we can say that his second adventure occurs a year later–or a year and 2 weeks later, to be somewhat more precise. And that date–6/9–does it look familiar? That’s right, it’s the day that Japanese fans (and recently worldwide fans too) are already celebrating as “Rokku Day“! All this time, it had also been the story-canon anniversary of Rockman 2. Could it be a coincidence, or is R2 somehow the underlying cosmic nexus of all of Rockman? Truthfully, the game developers might have chosen that date for the same Japanese phonetic pun reasons that fans in recent times have done. Whatever the cause, that’s one more reason for fans to celebrate the 9th of June. Next up, Rockman 3. This one is a bit trickier. The August 28 is 80 days after June 9, but did the two happen the same year? A year apart? Even longer? 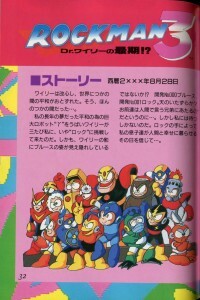 Many fans have judged the change from 200X to 20XX as a change of year or change of decade, even though not all Rockman 3 sources agree about the 20XX, and that “X” could also easily have represented a 0 in the first place. (X, 0… sounds like we’re talking about the X series now.) Considering the trend that there was a year between 1 and 2, and between 3 and 4, one might say that another year separation seems reasonable, particularly if you want to squeeze the Rockman World adventure in the span between. But on the other hand, Dr. Right did mention what a brief peace it was, and the time between 4 and 5 is about 2 months (very similar to what 80 days could amount to), then between 5 and 6 over a year again… was there a repeating pattern like 12-2-12-2? Hard to tell. The only thing I will say is that it seems like making it over 2 years seems like quite a bit longer of a stretch than it needs to be. 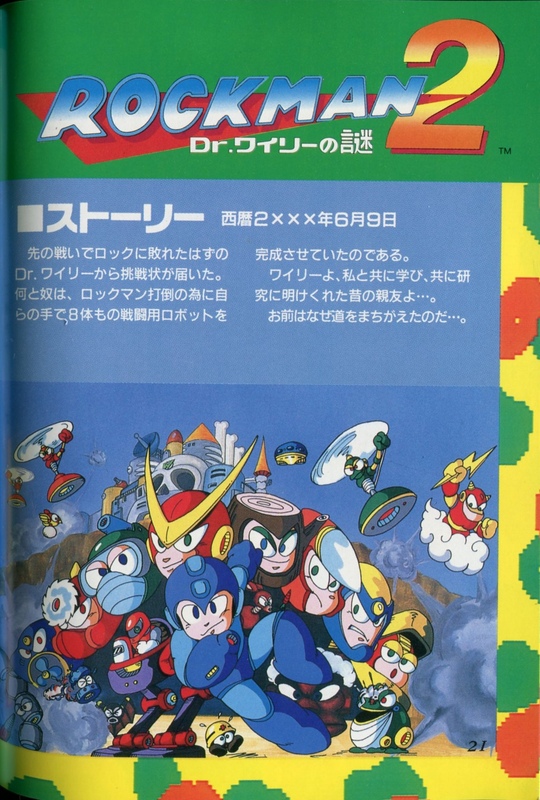 At any rate, if you believe a year to the day from the destruction of Gamma for the next game, you might imagine that Rockman 4 could take place in late august or early September, and then 5 perhaps in November…. The Rockman Character Collection is full of fun little surprises, so don’t you be too surprised if I pull it out again before the month is over. We’re still celebrating an anniversary here, after all! 9 Comments to "From the Journal of Thomas Right"
Nice! I like those three. Maybe there are 4-6 journal of Thomas Right books, huh ? Maybe somewhere, though I haven’t found ’em yet. The search continues! Very neat tidbits of info, SB20. Did you know that the Thailandish tome The Legends of Rockman gives the same order for the games? The disclaimer says it isn’t 100%, but I completely agree it is the most logical order! Yeah, I was quite amused when I saw that. The only thing I’m not quite sure of now is World3’s placement before R5. Complete Works states 2 months of peace ‘since the last battle,’ which I’m inclined to take as an uninterrupted time passage from R4 (like R6 to R7). But then, World3 uses the New Rock Buster from R4 instead of the Super Rock Buster from R5. That would instead make it 2 months since World3, and not R4. Complete Works doesn’t, but some of the books are more specific about 2 months after Wily’s fourth attempt at WD or after the battle where Wily was pulling Cossack’s strings. The main titles and World titles almost always reference their events (when at all) from the last installment of their series rather than to a game outside that set. I guess that’s why I’m comfortable saying that even if it doesn’t sound like acknowledging room for a game to take place in-between, it can still work. I’ve seen some fans put World 5 between 6 and 7 despite the continuous jail sentence, and it probably comes down to a similar thing: he could have broken out, been thrown back in the slammer to be broken out again, and they wouldn’t make reference to it. There’s some decent reasons for why they’d think that, too, so I can’t really say much except that I personally think it’s smoother the way you and the LoR book set it up. A logical preference thing. Anyway, I have a little bit on Rockman 5’s story from the manual here: http://kobun20.interordi.com/2010/09/13/more-monday-blues/ and my interpretation of that goes that he was on his toes right up until he let his guard down some 2 months after 4, and that’s when the doc-napping happens. So the adventure in World 3 he’s still on his game, so to speak. But you’re right and I can totally understand what you mean, and that isn’t a lot of time for another adventure to happen so quickly. It could also be an early introduction of the Rockbuster and Eddie if you want to place it before, or just a temporary retooling of the buster after 5. You gotta go with your gut, my friend. Like you said, the main and sub series definitely have this trend of self-referrals where everything from the other line is ignored. I guess that’s why RnF was once such a big deal, and why we much appreciated the throwback to it in R9. I can see ‘some’ merit in moving World5 after R6 yet before R7, but you’d have to shift Super Adventure around as well. And Super Adventure is a challenge in its own right. Have any insight on this? SAR is a hard nut to crack. I’ve seen quite a few fan timelines just not even try to place it, even before Inafune dissed it in R20. I have occasionally seen it placed after World 4 and either before World 5 or before 6, but for the same reasons you provided I think it works a little better after W5. Still, SAR does contain an enemy from 6 which might point towards it taking place after. Wily working with Right as part of some parole sentence then having W5 follow that works too, even though there’s no 100% guarantee that Wily was caught after that ending. Most of the reasons I’ve seen for putting W5 between 6 and 7 have been speculatory or false, things like Beat going missing in W5 and not rescuing him until 7. 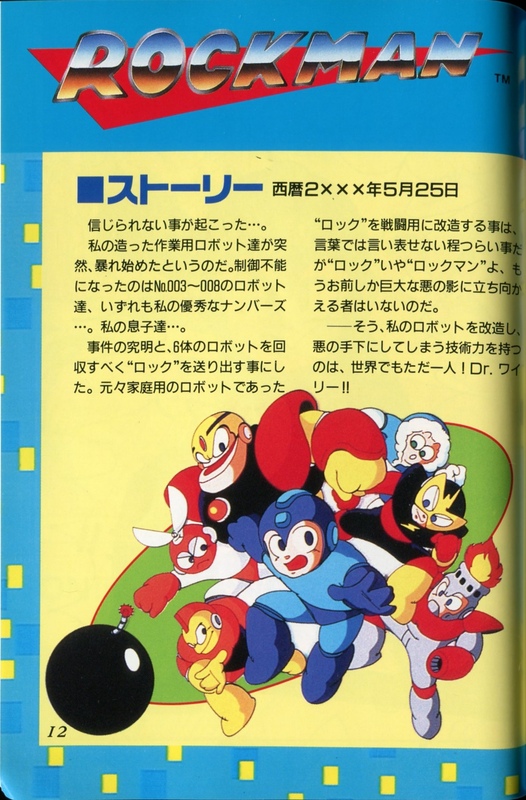 The only compelling reasons for me were that the Rockman & Rockman X Daizukan and its successor the Rockman & Rockman X Himitsu Daihyakka listed them in that order. Carddas did as well, but since they’d already done Rockman 6 as a set they couldn’t really go back in time and change that succession. But the game orders in neither of those books nor the card series could really be called a comprehensive timeline. Considering Shadow Man’s “permanent death” in SAR, it must be after Battle & Chase and MM8, unless the racer is a Copy Robot or he had another backup.